Kenneth Archibald, to the Huckins family boat yard, which her grandfather, Frank Pembroke Huckins, had founded in 1928. 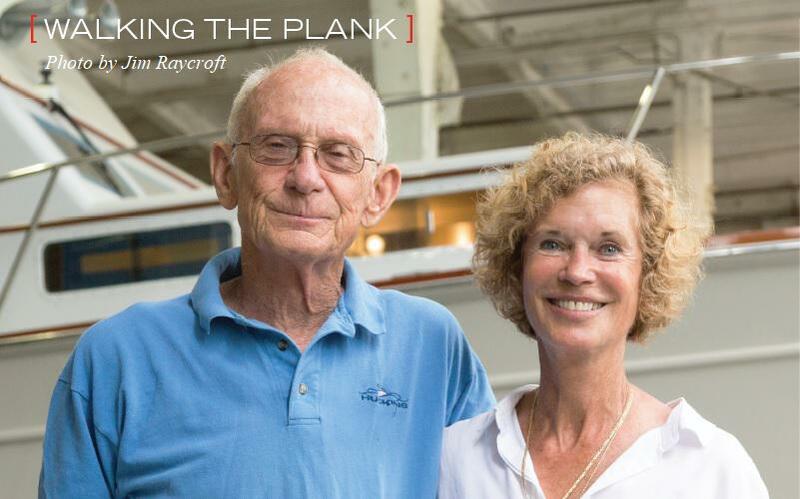 Cindy and Buddy continue the rich heritage of building and maintaining Huckins yachts. First memory of being on a boat: When I was about 5 years old, my father bought his first used Huckins. It was a 28-footer, one of only three that Huckins built. I was so excited that I jumped all around on the seats only to find out that I was jumping in seagull poop. My father restored the boat, and no more seagull poop. Buddy’s first memory is being tied down to the engine box on an open boat in the Gulf of Mexico as his father took him fishing off the Texas coast. First boat you owned: When I was 10 years old my father said that he would build me a boat if I could swim across the St. Johns river. From where we lived it was a mile and a half across and my dad followed me in a row boat. I swam across, and he built me a 12-footer in our garage. He powered it with a Kiekhaefer Mercury 22-hp outboard and because the Mercury was built late in the production run, Mr. Kiekhaefer had my name engraved on both sides of the motor. Buddy’s first boat was his father’s 1951 22-foot Chris-Craft. get out early in the morning to ski. boat was a 1952 34-foot Huckins named Cap. Your dream boat (to own or skipper): We already have our dream boat, our 1951 Huckins Ortega 40. The next dream would be new engines. Most rewarding (sailing) experience: When I was about 12 years old, a sailboat in front of our house turned over. He wasn’t very far out, so I swam. I helped him get the sails down and right the boat. In exchange he took me sailing. I learned that he was an admiral in the Navy and that he knew my parents. Many years later he came to my wedding and told that story. could in case we lost the other engine. By now we had broken the mirror in the forward head and the interior was a shamble. About 3 a.m.
the Coast Guard cutter finally showed up and after several tries got a line to us. We were thankful to be alive, and on the way in we were all comatose on the bridge deck. Your most memorable experience aboard: Many summers cruising the Bahamas with friends on the Huckins 74 Brighthour, snorkeling, fishing and lobstering. On one of those trips, anchored in the middle of nowhere, Buddy stood on the cover board after dinner, fishing with light tackle, with no light except for the stars. Longest time you’ve spent at sea without setting foot on land: A week at anchor in the Bahamas, in the middle of nowhere. Over three weeks, we would only touch shore to provision. Favorite nautical book: For Buddy that would be Small Boat Repair by Robert M. Stewart. He worked with him at Huckins and Buddy says he taught him so much about boat building. Favorite nautical cause you support and why: St. Johns River Keepers. They are conscious of all of us who enjoy the river. Favorite quote about the sea: It’s not a quote. Just have respect for the sea.